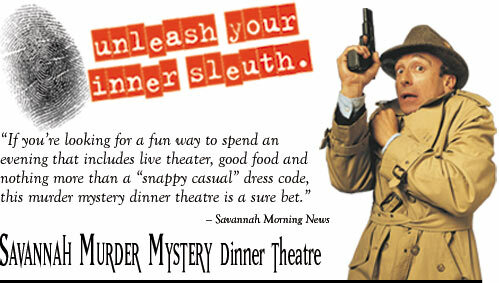 The Savannah Murder Mystery Dinner Theatre There are no current performances. Our most recent show was "Murder Ahoy!" -- a boisterous buccaneer mystery by Jim Daab! You had to lock up your wives and daughters, and hide your able-bodied sons! 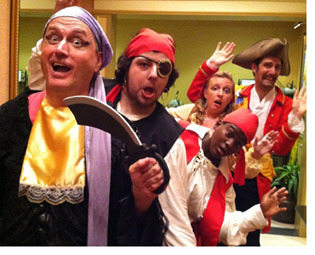 Audiences joined Manfred the Marauder—a scalawag of a pirate—who was spotted sailing the Savannah River and camping out on Hutchinson Island. No one was safe while he was around. He kidnapped your women for ransom, and shanghaied your men when he needed able-bodied seamen. The old Captain kept that parrot on his shoulder to watch his back, or there would have been more than 16 men on that dead man’s chest! Read the Savannah Morning News article about our previous show "Who Wants To Kill A Millionaire?" We can accommodate groups of ANY size in ANY location. For more information about booking a Murder Mystery Dinner Theatre for your convention, meeting or group event, please call (912) 247-4644 now. Click here for more info about group bookings. 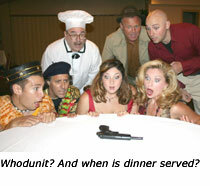 Tom Coleman III has successfully staged more than 30 productions of Murder Mystery Dinner Theatre in Athens for corporate client events, office parties, the Mayor’s Council, private surprise parties and the general public. The veteran director is the founder of Savannah Community Theatre and has produced and directed more than 200 shows since he began his career over 35 years ago. A graduate of the University of Georgia with a BFA in Theatre, Tom has served on the board of the Georgia Council for the Arts and the Southeastern Theatre Conference. For the past twenty years Tom served as the artistic director of Athens Creative Theatre before returning to his hometown.